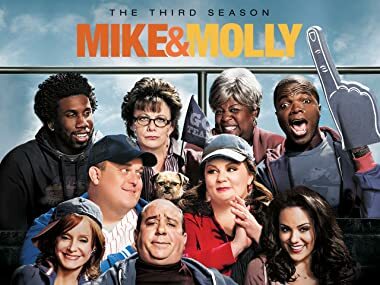 Wedding bells have rung for one of TV’s favorite couples, as the funny and endearing love story of Mike & Molly continues to unfold in each of season three’s laugh-out-loud episodes. His-and-her versions of domestic wedded bliss are at the heart of the hilarious third season, including all the laughs, love and lighthearted comedy that they find themselves mixed up in. In the third season premiere, Mike is inspired by their honeymoon to change his life and travel the world, while Molly worries how their friends and family managed without them. When Vince throws out his back, Joyce disappears, leaving Mike and Molly to care for him. Meanwhile, the newlyweds struggle to write thank-you notes for their wedding gifts. Molly is mortified when she reviews her wedding photos and sees that Mike either has his mouth open or his eyes closed in every single shot. Mike and Molly decide the time is right from them to start trying for a baby. Meanwhile, Carl gets upset when he learns that Molly is still spending time with Christina after their breakup. Mike is put in an uncomfortable situation when his mom starts dating his boss, despite his many reservations. GERALD McRANEY guest stars as Mike’s boss, Police Captain Patrick Murphy. With the house feeling crowded, Molly decides to have a yard sale, while Mike and the guys take Carl on a fishing trip to help him forget his breakup with Christina. When Mike gets sick for Thanksgiving, Molly is secretly thrilled because she won’t have to cook until Vince invites his brother, Frankie. When Mike gets nervous after Molly doesn’t get pregnant after weeks of trying to have a child, he turns to Carl and Samuel for advice. Molly encourages Mike to pursue a detective position on the force, but the stress of taking the qualification exam starts to take a big toll on their relationship. Mike dresses as Santa, but feels more like the Grinch when he can’t contain his frustrations over Molly’s Christmas spending. In an effort to boost their chances of getting pregnant, Molly encourages Mike to join her in giving up caffeine and eating healthier, causing them both to have major withdrawals. Mike prepares to spoil Molly for her birthday, but his plans go awry after he eats psychadelic gelato made by Victoria’s friend, Tom and goes on an unexpected trip. Mike begins transforming the basement into a living area for he and Molly to live in, but the construction work is more than he – or his eyebrows – can handle! Mike and Molly encourage Harry to take Victoria on a date for Valentine’s Day, and everyone is shocked when she accepts. Mike studies male fertility and visits a clinic to ensure that his “swimmers” are up to the task of starting a family with Molly. Molly enjoys some retail therapy and goes off on a shopping spree after Mike storms off over a disagreement and disappears at the mall. Carl and Samuel host a St. Patrick’s Day party in hopes of attracting some lucky ladies. Meanwhile, Molly reveals juicy secrets from her previous St. Patrick’s Day excursions to Mike. Molly joins her sister on a Spring Break road trip to party with Victoria’s friends from junior college, while Mike pulls some strings with his boss for some overtime assignments. Even though Mike’s birthday wish is to have his wife and mother get along, Molly and Peggy can’t seem to play nice as they try to plan his birthday party together. After learning that Joyce gave up her artistic talents when she became a mother, Molly decides that she and Mike need to pursue new hobbies before becoming parents. Mike goes on a junk food binge to cope with missing Molly. Meanwhile Carl contemplates leaving Chicago after learning heartbreaking news from James. Molly is so focused on directing a school recital that she doesn’t realize a fellow teacher is hitting on her. Meanwhile, Vince convinces Mike to join him in an unusual money-making scheme. In the third season finale, Mike and Carl get stuck working at the Renaissance Faire after their boss, Captain Murphy, gets dumped by Mike’s mother.